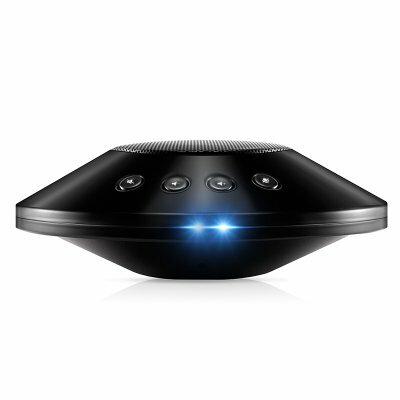 Successfully Added Video Conference System - Real-Time Calling, Remote Video & Audio, 360-Degree Speakers, for Windows, Mac, Android to your Shopping Cart. Easily engage in voice and video calls with colleagues around the globe with this stunning video conference system. This electronic gadget is a must have for companies of any size. It allows you to engage in remote meetings with a large group of colleagues no matter where they are. With its stylish flying saucer design, this conference system looks great in any modern office. It features an easy plug and play design which makes it simple to use by anybody out there. Thanks to its Windows, Mac, and Android compatibility, you can use this office gadget with the vast majority of computers and smartphones on the market. Whether you use it for meetings or remote teaching, this useful gadget is sure to meet your demands. Never before was giving a remote meeting this simple. This video conference system supports online voice and video calls through MSN, Skype, and more. It comes with a built-in 360-degree speaker and features an adjustable volume. You’ll furthermore be treated to an LED light indicator as well as a high-quality built-in microphone which can be muted. If you’re looking for a real-time conference system to stay in touch with remote colleagues, this office gadget is perfect for you. Simply plug it in, synchronize it with your device, and you’ll be ready to go. This video conference system comes with a 12 months warranty, brought to you by the leader in electronic devices as well as wholesale office gadgets..